I am working on deploying a web app to a browser (default: firefox) using Idea 9.0.3 on Ubuntu 9.10. Tomcat starts and the following message is seen as the last of a series of messages in "output" under the"Server" tab. Following this, I need to manually open up the browser, go to Tomcat Web Application Manager at http://localhost:8080/manager/html to check if my app is deployed and then launch it from there. I was expecting that IDEA would automatically launch the Firefox browser with my web app deployed. Please find attached a few screenshots of my settings. Please let me know where I am going wrong. I have googled for answers to my question, also searched thru jetbrains forums - but could not find useful information to solve the problem. If someone could give me a few pointers to investigate, that would be great. Your settings look good to me. Is there anything in the idea log files (located at ~/.IntelliJIdea90/system/log) that might provide a clue? Is there a possible permissions issue? p.s. you are correct that IDEA should automatically launch the browser given your settings. I can say that it works on Windows. Never tried it on Linux. I have the exact same problem on Windows XP with IDEA 9.03. Not sure why its not working but would love to know. I never knew about the log file .IntelliJIdea90/system/log/idea.log. Thanks a lot for pointing it out. There is no META-INF folder inside the "exploded" folder. Am I missing out something? Is this the cause of the problem? This exception is harmless. Did you see 'Connected to server' message in 'output' panel of 'Run' toolwindow? I could not find the "Connected to Server" message in the "output" of "Run" window. These are the messages I get. The "Deployment" window under "Run" window shows the name of the artifact to deploy at the server startup "mywebapp:Web exploded" with a green "ok" symbol - which makes me assume that the app has been successfully deployed. 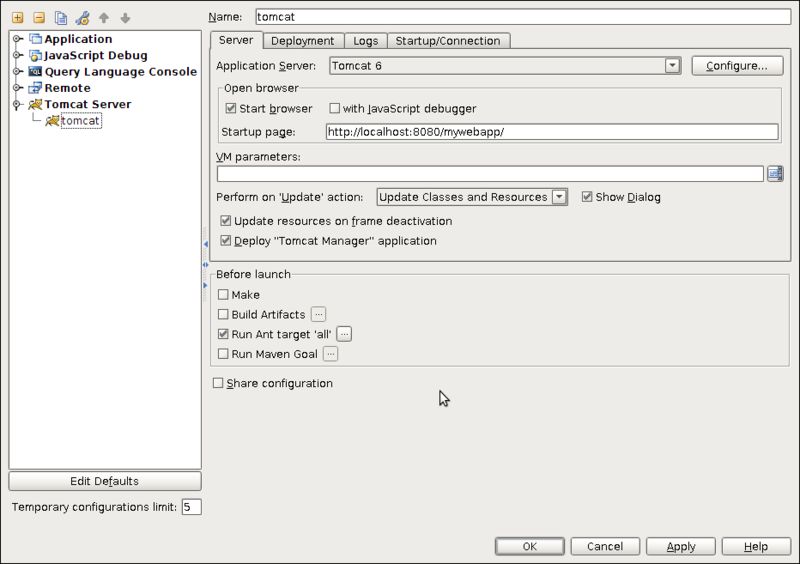 Following which I need to manually open the browser, go to the "Tomcat Manager" application and then start mywebapp. I think the problem will be fixed in next EAP build. > log4j:WARN No appenders could be found for logger (org.springframework.core.CollectionFactory). Same problem here, using IDEA 9.0.4 on windows XP. The problem started a few weeks ago, when I reinstalled my laptop. Before that, everything worked fine, using the same IDEA version. I did switch to a more recent Tomcat though (6.0.32). Might this be the cause of the problem? Just confirmed that it is the tomcat version. 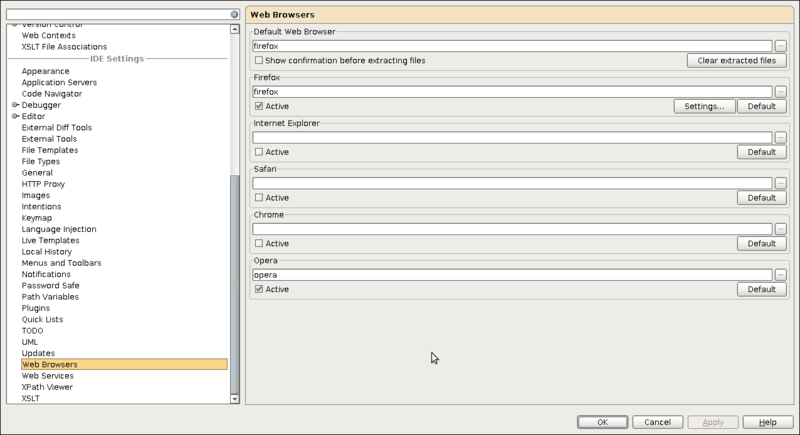 Using Tomcat 6.0.20 (which I used before) my webapp is automatically loaded in the browser. However, this does not happen when using Tomcat 6.0.32! file: the Context element information will be loaded by all webapps. file: the Context element information will be loaded by all webapps of that host. directory. The name of the file (less the .xml extension) will be used as the context path. Multi-level context paths may be defined using #, e.g. is placed in the host's appBase. yourcontextname.xml in that folder for unknown reasons. 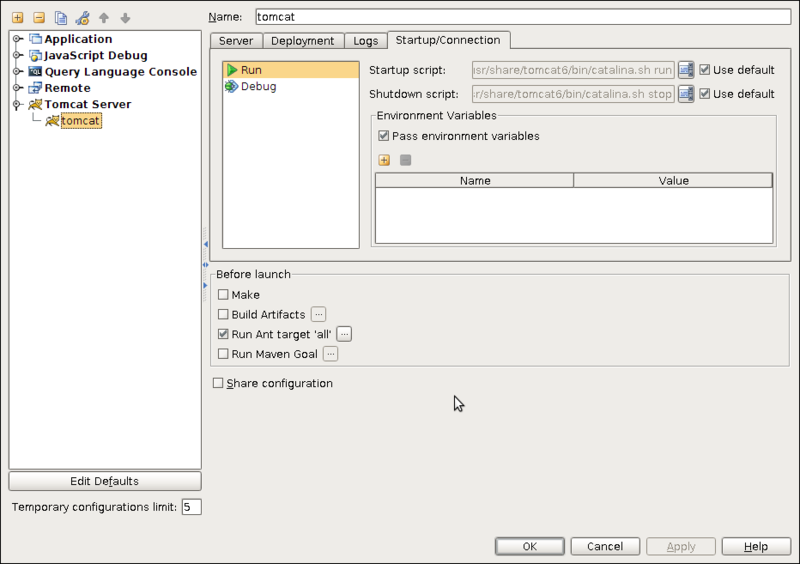 Also, i see idea deploys all the bundled applications, although corresponding checkbox is unset.